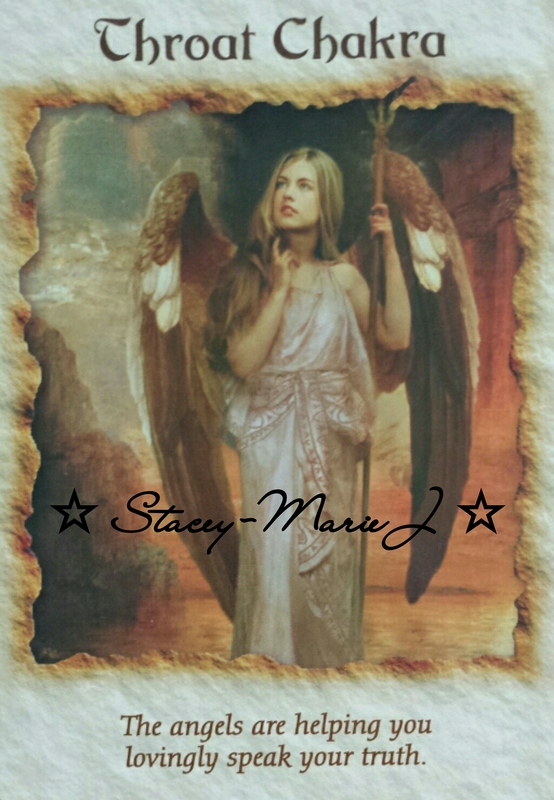 I wanted to ask my cards what gift we could all enhance, focus on and in my mind I received my Angel Therapy deck which means this deck would answer my question best for us. As I was shuffling and asking my question, I didn’t get much further than a few words when the Throat Chakra card flew out like a lemming off a cliff. Instead of writing the guide book version of the card’s meaning exactly as worded, I will go with my thoughts and feelings using it as a guide only. The Throat Chakra is the energy centre which governs our expression – verbal or written. It is also our creativity. Our true thoughts and feelings can and should be acknowledged by us and expressed. If we ignore that principle then we have problems. We begin to darken and shrink the throat chakra. Which will lead to all different sorts of issues when communicating. An example could be when we talk in public we may become tongue tied, have difficulty making ourselves heard or getting our point across. Our fears of what may happen if we speak up or what people might think of us can stop us telling our truth. Maybe we have been punished for speaking up before. It could be a cause from a past life – my communication issues stem from something I saw in a past life as a 10 year old orphaned boy, I witnessed the murder of a woman by a man. I saw it and never spoke up, never told a soul then or for the rest of that life because I feared that man would find and kill me too. But it still effects my communication today on top of the experiences in this life. I don’t always speak up – even when I feel that adrenaline speeding through my body and what I want to ask or say is on the tip of my tongue, I still over ride that natural process. I frequently get tongue tied, especially with those who I have to answer to. I cannot express my emotions. I hold so much in even if it effects my relationships. On the other end of my spectrum I will spill out vileness, I will vent my frustration and bitterness about people which makes me feel awful. It hurts me in the long run. One extreme to the other is no good to us or anyone else. So we may hold it in, even repeatedly hold in in so it hurts us in the end. Or we may be hurtful and express ourselves in an unhelpful and negative way. We end up energetically depleting ourselves and feel worse. We feel blocked and frustrated. It is a vicious circle and one we must break. We can ask the angels (or any Divine energy you like to call on) to unlock our self expression. They will send pure light and love to our throat chakra. We can ask to them to help us speak up in a loving but assertive way. They will help guide our words if we want them to. Archangel Gabriel is the messenger angel. Angel of communication.